You are here: Home / Customer Experience, Success, Loyalty, Retention / Start A Customer Micro Experience Playbook this Summer! Customer micro experiences play out big time, towards acquiring and retaining a loyal customer base full of raving client evangelists! And the summer months offer us all a bit more breathing room to ask ourselves questions about customer experience that, well, make us a bit uncomfortable. All you need is a One Millimeter Mindset™ shift in your own expectations. Instead of waiting for someone else, in some other department, to generate a To-Do list for you, start creating a customer micro experience playbook, yourself, on your own. After all, who knows your customers better than you do? On the other hand, who does, in fact, understand the Voice of Your Customers, far better than you do? Think about it. Your customer micro experience playbook captures the quality of how well you and your colleagues collaborate. First, think about it. If all of you operate in silos, what is the total impact on the quality of the customer micro experiences you create for customers? Just sayin’. Then, ponder your specific contributions. Consider whether or not you are too busy being busy fulfilling someone else’s internally-focused KPI’s. Also, consider whether meeting those internal KPI’s correlates with the value of customer micro experiences you simultaneously create for customers. Hmmmm….. Now I have you thinking. Creating a customer micro experience playbook connects internal customer perspectives with the outside world. What type of impediments? Impediments to things like collaboration, innovation and customer success. So, as long as I have you thinking about the variety of customer micro experiences you create, consider this. How many impediments do you, yourself, create for colleagues to move one millimeter forward, outside of the status quo? These impediments are negative, internal customer micro experiences. After all, it’s always easier to finger-point and play the blame game. On the other hand, no one’s watching you read this blog post. Go ahead. 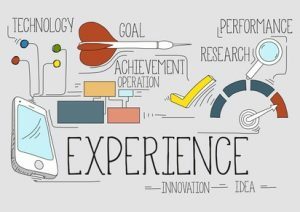 Consider whether you, yourself, are creating negative – or positive – customer micro experiences impacting collaboration, innovation and customer success. Good work! Do you realize that in doing that exercise, you just moved yourself one millimeter forward beyond your current professional comfort level? A little professional introspection often goes a long way towards professional innovation! Next, continue moving your customer micro experiences forward on a positive basis. In one millimeter increments, each day. Discover how, by taking the next steps. Has what you read Today started you Thinking about tomorrow? Contact me. Let’s create a One Millimeter Mindset™ program that fits your needs, including my 3-week Mini Program offered at a ridiculously low price point.